Coins can be a fascinating piece of history and art as well as an investment and hobby, and that is why historically people have collected them. Besides the actual gold and silver values, there are type coins made of copper and nickel that can be just as valuable as gold and silver coins. 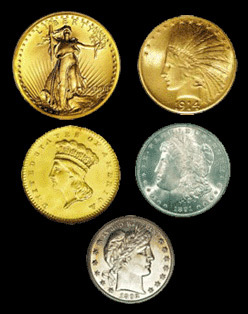 You can bring one coin or an entire collection in for a free appraisal – top dollar offer to purchase. You can count on VIP Pawn Shop to have the expertise and numismatic knowledge to buy your coins and collections. While some coins are simply worth their gold and silver value, many coins are worth far more than just that. Our expert numismatists coin graders and appraisers will grade your coins by their condition. Coins are graded by condition: AG – About Good, G – Good, VG – Very Good, F – Fine, VF – Very Fine, XF – Extra Fine, AU – Almost Uncirculated, then going into various degrees of Uncirculated – MS60, MS63, MS65, MS66, MS70 and Proof. We use NGC and PCGS coin grading standards to evaluate your coins, currency and collections. Our collector numismatic experts will ensure that you receive the best price for your coins and currency. We recommend that you do not clean your coins because that devalues them. Bring them in the original condition even if they are tarnished, as our experts can see through that and determine the values and grades. Many times the patina actually adds value to the coins. We buy Proof and Mint Sets, Type Coins, U.S. and Foreign Coins, Untied States Gold, Silver and Platinum Coins and Bullion, Canadian Silver and Gold, Eagles, Krugerrand, Maple Leaf, Pandas. Whatever you have, bring them in for a free expert appraisal.